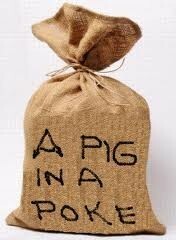 Beware, Pig in a Poke, Know What You are Buying! Home / Lakewood Ranch Plumber / Beware, Pig in a Poke, Know What You are Buying! Pig in a poke, what does that mean? When I was growing up, it was a common expression referring to not being taken when one was buying something. Today, people are still buying houses that have been vacant and foreclosed on. They do this do make money. However, beware of what you want to buy. Some of the people that fix up a home for resale, only give the house a cosmetic face lift. So the house you are looking at may have newly painted walls, new flooring, new cabinets, plumbing fixtures, appliances and mirrors. This all may look great, but what is the age of the house? If the house has cast iron plumbing waste lines under the floor, it is old. The plumbing is the heart of the home. If those new toilets keep stopping up after you move in, it may be because they took out the old toilets that used three to seven gallons of water to flush and put in the new 1.6 gallon water saver toilets. This may actually create stoppages. The reason this may be happening, is because over time, cast iron pipe will rust and scale up. Especially, if the house sits vacant. The waste pipes dry out. The scale and rust start impeding the flow of the paper and waste. Paper starts catching, solids start building up and before you know it, your dream home that was given a cosmetic face lift, has become a plumbing nightmare. This could all be prevented if you camera the waste lines, before you buy. The technology available today, allows professional plumbers to view the condition of the drain lines under the concrete floor. Considering the investment you are about to make in your new home, hiring a Florida State Certified Plumbing Contractor to camera your waste lines is a very smart way to spend your money, so you don’t end up buying a Pig in a Poke! If you would like to schedule a Plumber in Sarasota or Bradenton to camera your waste and sewer lines, call Wimpy’s Dependable Plumbing. We have the latest technology available in cameras. If you can’t be around when we camera the lines, we can e-mail you the video results. We want you to love your new home and your plumber. We are a 40 year old family owned and operated Plumbing company. Schedule online at www.LoveYourPlumber.com or call us at 941-322-1911.